This is adventure climbing at its best, especially when linked with Arrowhead Spire. The route is obscure and committing with incredible exposure and a cool knifeedge ridge finish?a Yosemite rarity.With a few exceptions, most pitches are high quality and well-protected, and you?ll climb everything from wide cracks to faces. 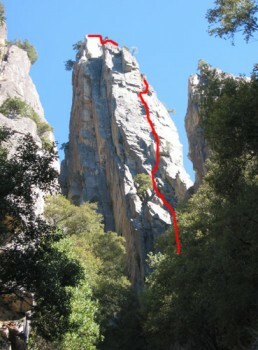 While you can pull through most of the cruxes on gear, this route is only appropriate for confident and fast 5.9 leaders. Which SuperTopo guidebooks include a topo for Arrowhead Arete?